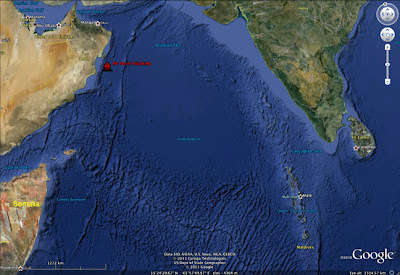 At approximately 0600Z on 28 February, the Bulk Cargo Carrier MV DOVER was pirated approximately 260 nautical miles North East of Salalah in the North Arabian Sea. The Panamanian flagged, Greek owned vessel was on its way to Saleef (Yemen) from Port Quasim (Pakistan) when it was attacked. Details of the attack are not known at this time. The MV DOVER has a crew of 23 (3 Romanian, 1 Russian and 19 Filipinos). There is presently no communication with the vessel and no information regarding the condition of the crew. Alert number 101 / 2011. At 0606Z UTC / 28 FEB 11 / a merchant vessel was attacked by pirates in position 18°48N 058°25E.